This is not the messiah you are looking for. It is Saturday in Nazareth and everyone is assembled at the synagogue. Jesus is there; the son of Mary and Joseph. He has been gone for a while and the reports coming back are amazing. He has been preaching and teaching and healing and doing miracles. He was baptized in the Jordan and the heavens opened and the voice of God spoke. This Jesus guy is amazing and now He is back in His hometown where He grew up. This is going to be something to see. What is He going to do here? Jesus then rolls up the scroll and hands it back to the attendant and sits down. Everyone is watching Him. Is that it? Is that all He is going to do? Everyone is staring at Jesus waiting for Him to say or do something. What is that? What did He say? Did He say that He is the one who is fulfilling Isaiah’s prophecy? He is the one to proclaim good news to the poor, to proclaim liberty to the captives to make the blind see and free those who are oppressed. This is Isaiah’s prophecy about the coming Messiah and Jesus just said that Isaiah is talking about Him. He is the coming Messiah. And He is here with us, proclaiming this great good news. And the people marvel at what Jesus just said. Could it be? Is this really the Messiah? Is God fulfilling His promises right here with us? The mood in the synagogue must be just surreal; the people marveling at what is happening; the long promised Messiah is here with us. But then someone speaks and breaks the wondering, marveling mood. “Isn’t this Joseph’s son?” The people come back to the reality of life in Nazareth. All of the pregnant thinking about the marvelous things Jesus has said deflates as the people remember who Jesus really is. We know Jesus. He is the son of Mary and Joseph. We know His family. We watched Him grow up. Who is he to claim that He is something special? We’ve heard about what He did in other places, but all He has done here is talk. This may be more clearly translated, “Physician, take care of your own.” Jesus knows what the people want. He knows they want Him to do in Nazareth what they heard He did in Capernaum. But Jesus does not perform on demand. The purpose of Jesus’ miracles is to help reveal who He is; that He is indeed the Son of God come to take away the sin of the world. Miracles are not to entertain or to convince doubters. Miracles are done to reveal who Jesus is, and what He has come to do, but they are not done to prove anything. Jesus tells them, Luke 4:24 (ESV) 24 … “Truly, I say to you, no prophet is acceptable in his hometown.” And then He relates a couple of Old Testament accounts of prophets who do not do great things for their own people, but rather help foreigners. So, is that how it is going to be? Jesus of Nazareth isn’t going to help the people of Nazareth. Jesus, son of Mary and Joseph thinks He is such a big deal, but He is a traitor to His own people. And what moments before was a sense of marvel turns to a murderous anger. 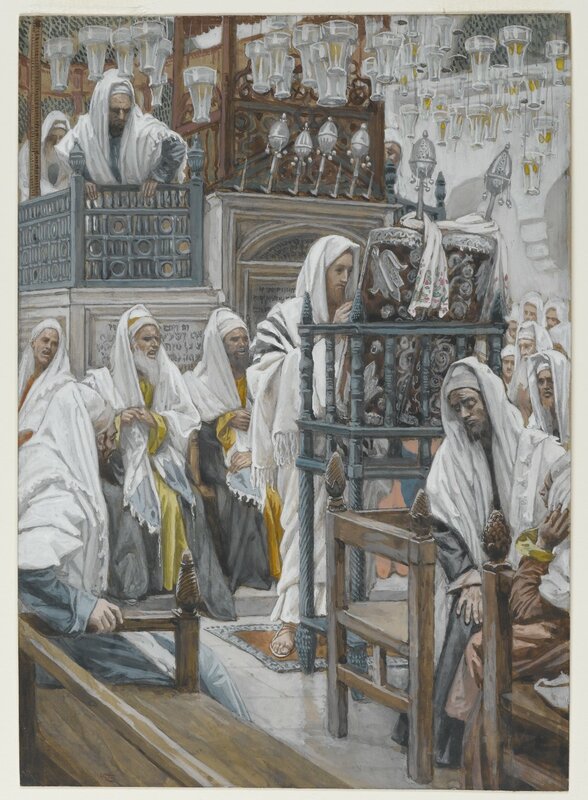 The people heard what Jesus had to say and they rise up in the synagogue against Him. They came in anticipation of welcoming Jesus home, but they are now filled with such anger they want to send Him to the grave. The people of Nazareth, filled with wrath in the house of God, rise up and drive Jesus out of the synagogue and out of Nazareth to the edge of a cliff so they can push Him off to His death. And then they get their wish; Jesus does a miracle. The crowd surrounds Jesus at the edge of the cliff and Jesus miraculously passes through their midst and goes on His way. It is not yet His time to be killed by His own people on a hill outside Nazareth; that will come later on hill outside Jerusalem. The people had been excited about Jesus coming until Jesus did not do what they wanted Him to do. Jesus is the Messiah, but Jesus is not the kind of Messiah they are looking for. I fear that this is a great danger for us. People are excited to hear about Jesus until Jesus doesn’t do what they want Him to do. Then they make up a new Jesus. There are so many voices out there telling you who Jesus is and what He is doing. There are many who will tell you that Jesus is the Messiah; the Christ, but then will preach and teach about how God’s main purpose is to help you achieve health and success and wealth, and the only reason for sickness, tragedy or poverty is because of your lack of faith. There are those who teach that Jesus is the Messiah, but His main focus is on social justice for oppressed groups of people. They teach that Jesus’ came to eliminate poverty and promote sexual diversity and fight climate change, and whatever the newest current issue might be. There are those who say that Jesus is the Messiah, but you need to finish what He started by doing enough good works to really merit God’s favor. Many have faith when things are going great and the bills are paid, health is good and the kids are doing well, but then when money is tight and illness strikes and the kids are straying, folks get angry at God and demand that Jesus be the right kind of messiah and make everything easy again. It is part of our sinful human nature to want to dictate to Jesus what kind of messiah He is supposed to be. But when we try to dictate to Jesus it means we are taking authority over Jesus. It means that we are rejecting Jesus as God and Lord and reducing Him to our servant to do our bidding. This is a great danger. Rejecting Jesus has eternal consequences. Nazareth rejected Jesus and He moved on. Many of the Jewish people rejected Jesus and He moved on to the Gentiles. We have seen this throughout history; people rejecting Jesus and Him moving on. Areas of the Middle East that were once deeply Christian now are Muslim. Europe was once the heart of Christianity and it is tragic to see how few Christians remain. In Eastern Germany, the Land of Luther, only about 2.5 percent of the population strongly believes there is a personal God according to a 2008 survey put out by the University of Chicago. As a nation of people from around the world, the United States has been a place where God’s word and grace has been raining down and we must gather in the harvest while it is there. Tragically, so many people are turning from the true Jesus; the Messiah revealed in the Bible, and creating their own false Jesuses that they think will meet their needs and expectations. Be aware. Already it seems the rain shower of God’s word and grace is moving away from North America to Africa, Asia and South America. Repent for the times that you have rejected the true Jesus and remain on guard that you do not create false expectations and demand that Jesus be the Messiah you are looking for, rather than the Messiah that he is. The true Jesus is the Messiah you need. He is the Lamb of God who takes away the sin of the world. He is the Messiah who is baptized into your sin, carries your sin to the cross, and dies for your sin. He is the Messiah who has power over sin, death and the devil, but does not promise to make you healthy, wealthy and wise. He is the Messiah who calls you to live a Holy life in an unholy world. He is the Messiah who truly is God in flesh who rose from the dead and ascended into heaven. He is the Messiah who comes to you in His Body and Blood for the forgiveness of your sins. He is the Messiah who tells you who He is. Jesus may not be the Messiah you are looking for, but He is the Messiah you need. Amen.